Beaded hat bands - Hand Crafted Elastic Hatbands and Horse Hair Beaded Hat Bands adaptable to most hats. Bone Bead Hat Bands - Two and three strand Bone Bead Hat Bands. 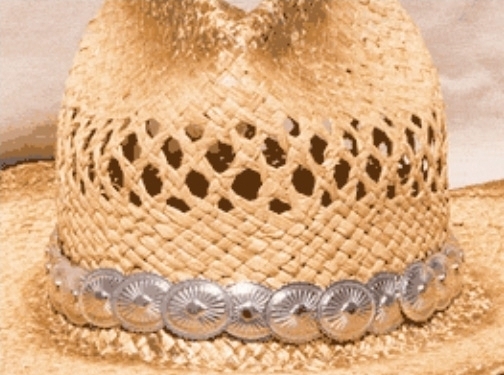 Concho Hat Bands - Silver Finish Elastic Concho Hat Bands. Horsehair Hat Bands - Vaquero Quality Horsehair Hat Bands. The Vaquero, or Spanish Mexican cowboy, was considered a highly skilled worker and was the first to use horsehair to braid hat bands. Horse hair hat bands and jewelry are a beautiful and tasteful embellishment. It can be a meaningful present for horse-lovers. Leather Hat Bands - We have a large assortment of quality Leather Hat Bands. Braided Suede Hat Bands - Braided Suede Hat Bands with Oak leaf caps. Suede is made from the inside of the hide. It is made from a hide that has been split, which makes it softer and more like velvet than its leather counterpart. Braided Leather Hat Bands - Three strand mystery Braid Leather Hat Bands. Leather, with its shiny surface, is made from the outside of a hide that has been tanned. Snake Skin Hat Bands - Stylish Leather Hat Band with Rattle Snake Skin Inlay and a Buffalo nickle form concho.